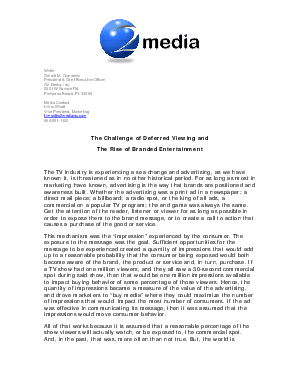 White Paper Published By: O2 Media Inc. The advent of the TIVO, or DVR devices, began the process of increasing the amount of deferred commercial viewing, inevitably creating the opportunity for "commercial skipping." Given that there is less and less willingness on consumers' part to allow disruptive advertising to interrupt their entertainment, companies continue looking for the opportunity to showcase their brands. At O2 Media, we are producers of television shows that run on Lifetime and the WE TV networks. These shows are a logical extension of Brand Integration and Product Placement strategies. They are clearly within the broadest definition of Branded Entertainment, but are probably better thought of as Edutainment or, as I like to refer to them, as Brandutainment?. These shows feature permanent hosts, mostly in a talk format, and provide a clear formula for entertaining the viewer with a broad range of topics from the weather, to book authors, to celebrity guests promoting social causes, to health and fitness, etc. They are shows that entertain, but provide viewers with potential solutions to everyday issues, mostly those faced by women -- who make most of the household decisions. This strategy provides the company seeking to establish brand positioning an opportunity to tell a more robust and in-depth story about what they do, while we get a chance to entertain, educate and engage our viewers. We also believe that by combining Brandutainment? with other aspects of PR, Promotion and Direct Response Marketing, a comprehensive marketing strategy can be built for the consumer products company of the future.